Experience our Unique Publisher Platform! Track Your Success with our Advanced Tracking Platform! Adwork Media publishers are provided with a robust platform that offers a unique collection of tools and features managed by our in-house development team. Our reporting manager, campaign manager, and other features are all designed around an easy-to-use experience that also incorporates the advanced settings you should expect from any network. Easily Monitor Your Success and Track Your Earnings! Our Proprietary Publisher Tracking Platform is powerful, unique, and best of all: simple. Access a variety of publisher tools and reports to make earning online even easier. AWM is also fully compatible with Tracking202 software. 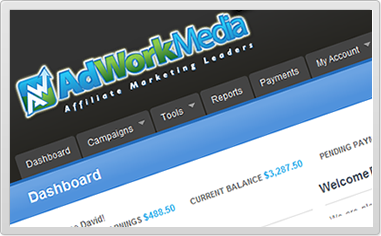 AdWork Media offers easy payments by PayPal, Check, ACH Direct Deposit/Wire, Payoneer, Payza, or Western Union. All publishers begin on a NET-30 payment schedule. Show us that you are an affiliate rock star and get promoted to a faster payment plan! View Earnings Per Click (EPC), Click-Through Rate (CTR), Conversion Rate (CR), and many other campaign metrics. Track the performance of deployed tools to determine which strategies are most effective. Conversion reports provide detailed lead data including referring URL, tracking ID's, EPC, CR, IP address/location, & more. Instantly integrate our services with your existing websites, applications, games, and web-enabled software to create the perfect monetization platform for your users. Our expert support team is available to help you integrate real-time tracking with your own site or platform.